A beautiful alternative to our clear-glazed prefinished Shaker style doors. These prefinished oak internal bifold doors feature the same classic good looks as the rest of our Shaker range but feature four frosted glazed panels as opposed to clear panels. 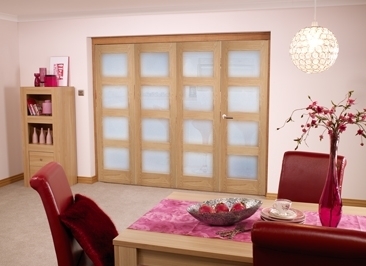 The glazed panels allow a gentle diffusion of light through the doors whilst protecting your privacy, which is why these doors are such a popular choice for dividing living and dining spaces. This roomfold system is available in 3, 4, 5 and 6 door options with a choice of three panel widths ranging from 1’9” to 2’0” and 2’3”. Whilst this may sound like a lot of possibilities to choose from, we pride ourselves on delivering the very best fit, every time. If you require any assistance choosing which system would be suitable for your home please don’t hesitate to get in touch with our team, who would be more than happy to help. As this system is supplied prefinished, there’s no further decoration required to the doors. Simply follow the instructions included in the easy to assemble kit and your doors will be up in no time! The kit includes the doors themselves, frame, hinges, running track and hardware. The frame itself is supplied unfinished to allow you to match it to your existing architraves and skirting boards. We do not supply handles or drop bolts to allow you to match existing ironmongery in your room.